A Solar Choice broker will help you, at no charge, decide what size solar energy installation best suits your needs and budget. In the meantime, we hope the following article will assist you in making the right decision. The best place to start is by taking a look at your most recent energy bills. Most energy companies have a graph on the back of your bill which sets out your average daily energy consumption. An energy efficient Australian three bedroom home, with an average sized family and reasonable use of air conditioning, will usually have an average daily consumption of around 15 kilowatt-hours (kWh) to 25kWh. Depending on where you are in Australia and how much daylight you receive on average per day, a 1kW solar power system will usually produce around 4kWh to 5kWh of energy per day. PVWatts is a great tool that you can use to estimate how much solar energy you can expect to produce if you go solar; the tool lets you adjust for variables like your system size and location. But remember that unless you have battery storage, your solar panels will only meet your electricity needs during the daytime hours. Unless you have access to a generous solar feed-in tariff (which most new solar homes do not), your solar energy is worth the most to you when you use it directly. The electricity from your solar panels will flow first into any appliances in use within your home at the time, saving you money by reducing the amount of electricity you need to purchase from your electricity retailer (usually at a rate of 20-30c/kWh). Any surplus solar will go into the grid, to net you only 6-10c/kWh. This means that you want a solar system that generates enough electricity to meet your daytime electricity usage. Interested in exploring how much you can save with solar? Check out our Solar Power System ROI Calculator! So with an average daily household electricity demand of 25kWh, a 5kW solar system would probably be the best solar system size – it would generate just enough solar energy to offset a chunk of your daytime energy usage without ‘wasting’ too much solar by exporting it into the grid. 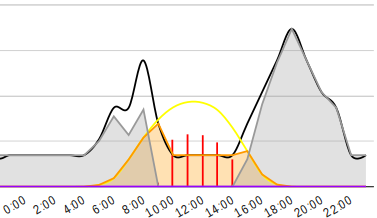 The ‘double hump’ electricity usage pattern, common in homes with school-age children. The times of highest electricity consumption happen outside of peak solar production times – the trough in the middle of the graph. 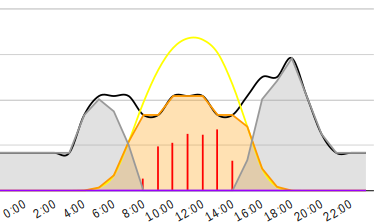 Red bars represent ‘wasted’ solar going into the grid. A 10kW solar energy installation, on the other hand, would probably be slightly too large for your home if it’s not occupied during the day. However, if you are home during the day (retired or have a home office, for example), it might make a good fit.. The ‘day focus’ electricity usage pattern, common in homes occupied by retirees or those who work from home. With the appropriately-sized solar system, such homes can easily use a significant portion of the solar energy produced, sending only a small amount into the grid. Want to explore what solar system size would be best for your home? Check out our Solar PV System Sizing Estimator! Want to explore battery size options & payback periods? Check out our Battery Storage Sizing & Payback Estimator! Hi I currently have a 5kw system I would like to upgrade to a larger system I am on single phase power. Could I upgrade to a 10kw system? Elon Musk was recently quoted as saying that his batteries may cost as little as US$100 per kwh by the year 2020. If this actually happens, it seems to change all the economics of solar PV. If this is an option, it might make sense to get a larger system than what is recommended. Both before and after a battery was connected we would want to feed any surplus production into the grid. It’s possible to get a ‘battery ready’ system installed – usually fitted out with a ‘hybrid inverter‘. That being said, it may also be possible to retrofit batteries onto your existing system when you’re ready even without a hybrid inverter. Battery storage is already on the cusp of making pure economic sense, although it may be a few more years before it’s a ‘no brainer’ for solar homes to install batteries. Another approach you could take would be to install an Enphase or SolarEdge system (microinverter and power optimisers, respectively). While these technologies may be a bit more expensive at first, they both have the attractive advantages of being a) easy to add additional panels onto and b) battery-friendly. This means that you won’t need to install all the extra solar capacity beforehand (as you might with a conventional system with a string inverter). The other upside is that both of these systems can potentially help you figure out how much battery storage capacity would best suit your needs once you’re ready to install your batteries. You could consider installing just a small amount of battery capacity to get started as well. Enphase’s AC Battery is perfect for this kind of situation because each unit is small and modular – you can install as many or as few as you like. hello Sir / Madam please i have an internet cafe in Ghana and we are having power crisis here in Ghana and you such business need power to run. so i decided to go for solar energy so i want to know how much will it cause me . Unfortunately we operate only in Australia so can’t help you out directly. As a rough guide, a system between 10-20kW might do the job for you, but you’ll want to do the math yourself (how much electricity does each of the devices you mentioned actually consume)? Additionally, if you’re not going to be connected to the grid and will be operating at night, you’ll also need batteries. What impact does solar power have on off peak floor heating. Can the power be stored for night time hours? Advice so far has been confusing and different depending on installers. 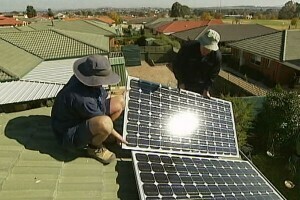 The way solar works right now (if you have no battery storage) is that you need to consume the solar energy as your panels produce it – that means that if you don’t use your floor heating during daylight hours, having solar panels is not likely to help you save a lot of money on your bills with regard to floor heating. Then again, we are not floor heating experts here – once the floor is warm, does it stay warm for a long time without further energy input? If that’s the case, then you could theoretically pre-warm your floors using daytime sunshine so that they’re warm for when you come home in the evening.